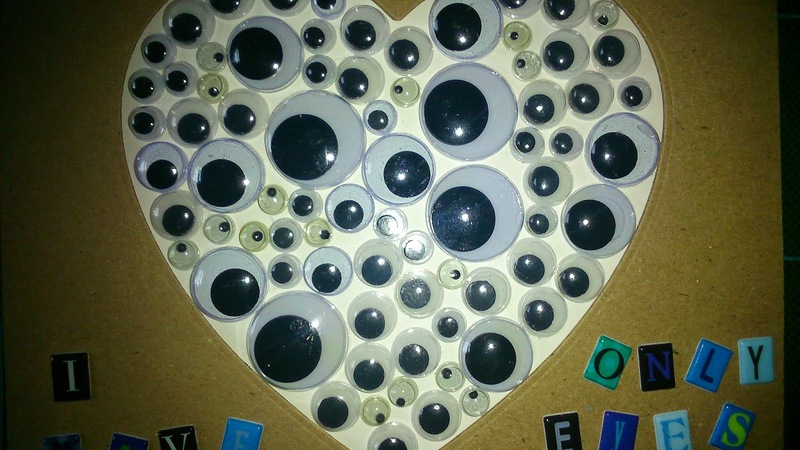 This year I went a little bonkers on my valentine's card for the other half. I thought I'd have a go at a card I'd seen on Pinterest. It was a little tricky but I got there. 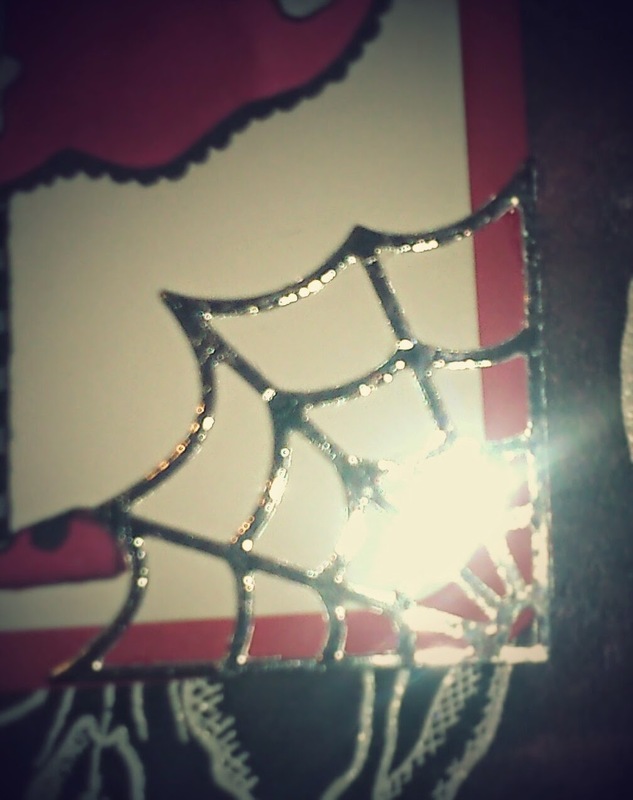 The first thing to do was to cut the heart in the front piece of card, I used an Xcut heart die to create my aperture. The next bit was the tricky bit, I had to put the aperture card over the base card to get the perfect shape. Easy-yeah? Nope I had to keep the top card lined up until I had the outside edge created becasue I would have been impossible to lay each eye in place if the top card had been stuck down as I was using foam tape to raise it up. My eyes were a mix of self adhesive and some that needed to be glued into place aaaaargh! 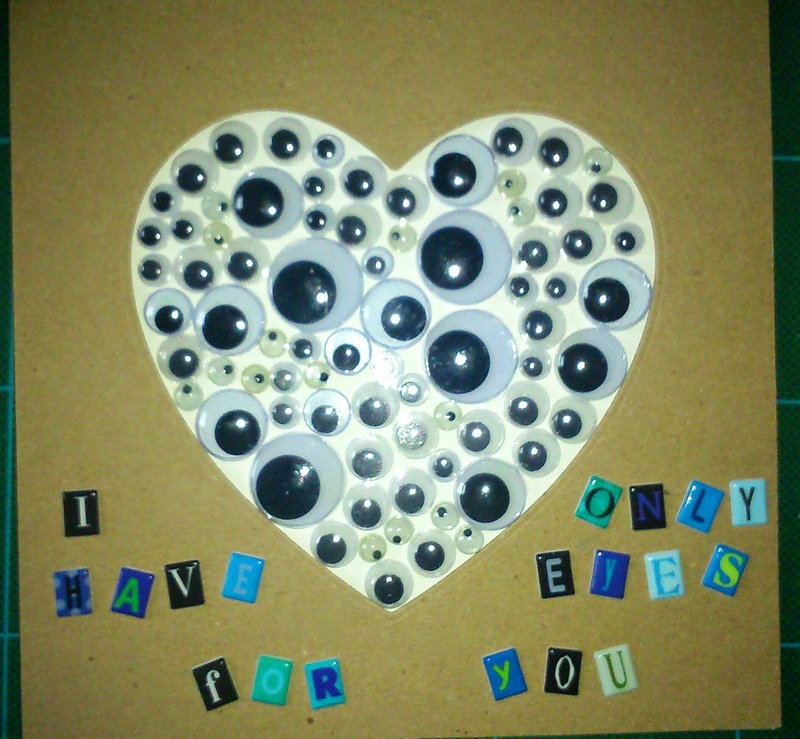 Finally I added some little self adhesive letters to write 'I only have eyes for you'. 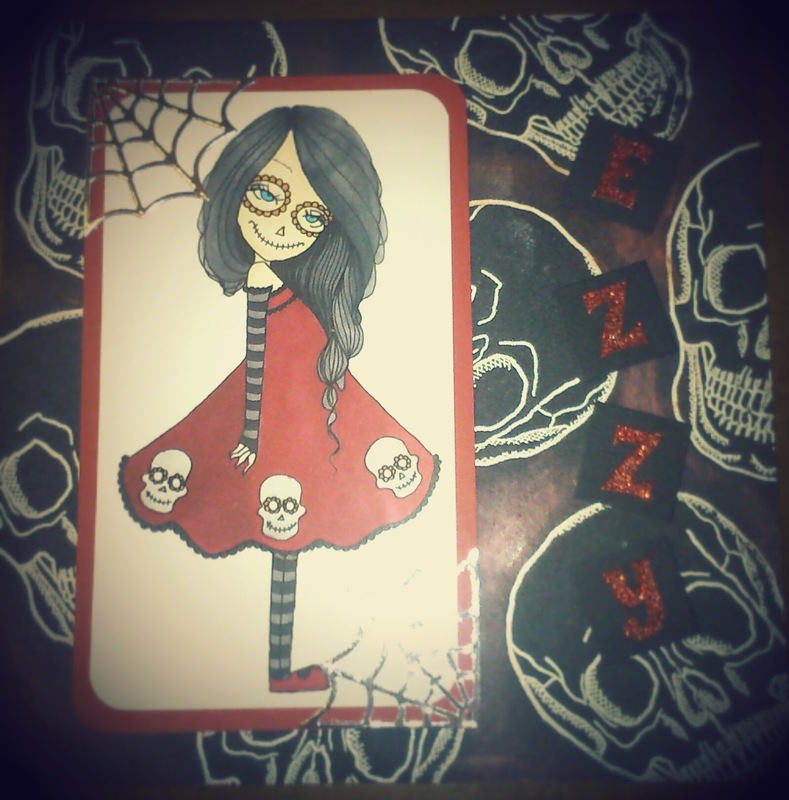 I was pleased with the finished card and my young man thought it was wonderful, so success! This is a little card I made for my friends birthday a while ago, however for some reason I forgot to post it on here, oh well. 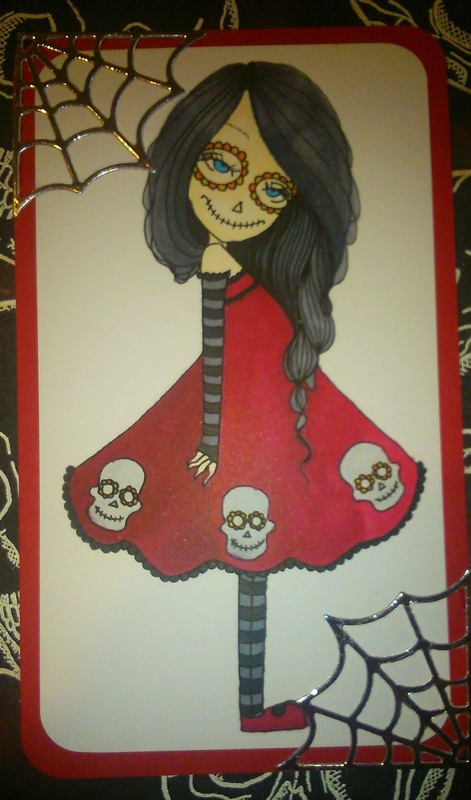 So this young lady is a digi from Helena Reis over at Sweet Pea Stamps, she is called Dia de los Muertos, I think she's just so cute. I then used an 8x8 piece of black card to start my background, I stamped and embossed several skulls in white and added a bit of red gilding wax around the skulls. 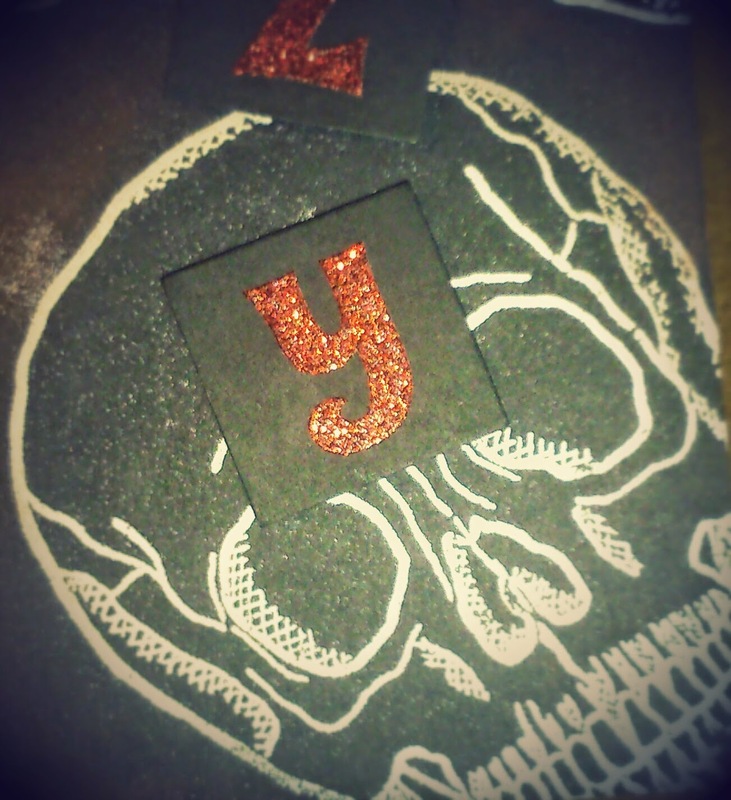 Finally I stuck red glitter letters to black card and stuck those to the finished card. 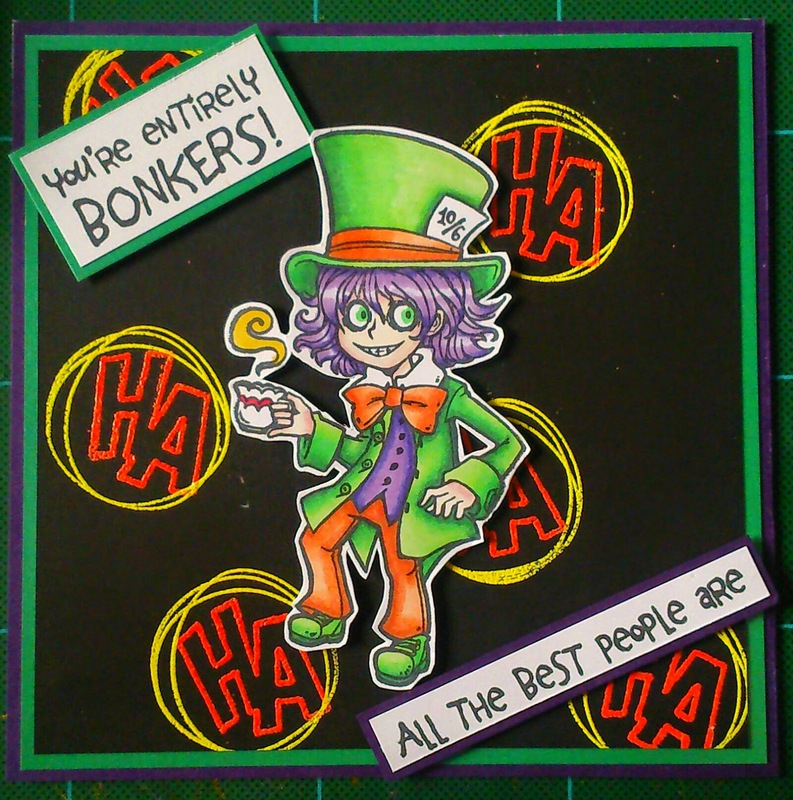 I have waited ages to use this stamp set, the Mad Hatter from Alice in Wonderland has always been one of my favourite characters, even before Johnny Depp played him. 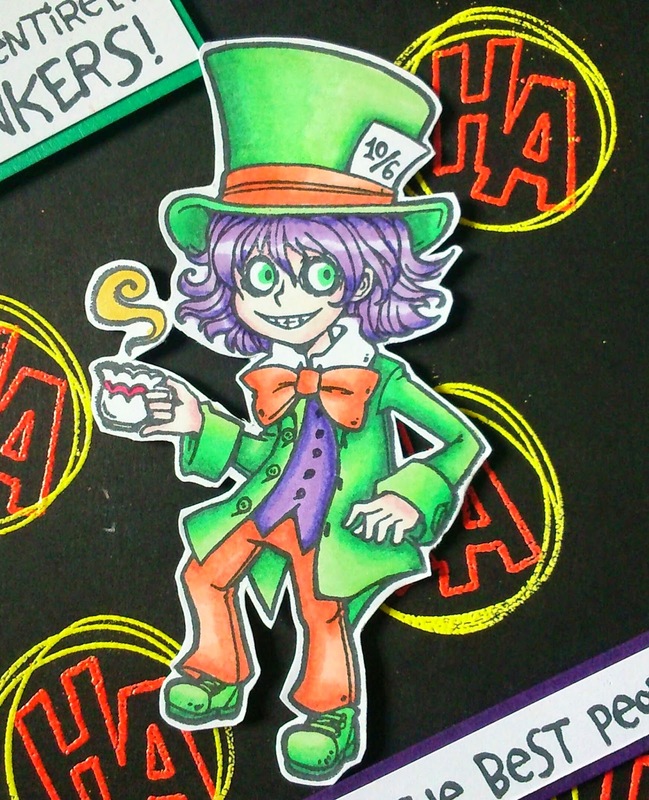 I used another favourite character as inspiration for the colour scheme, the Joker from the original Batman film, he gave me the green, purpl and orange of his clothes. 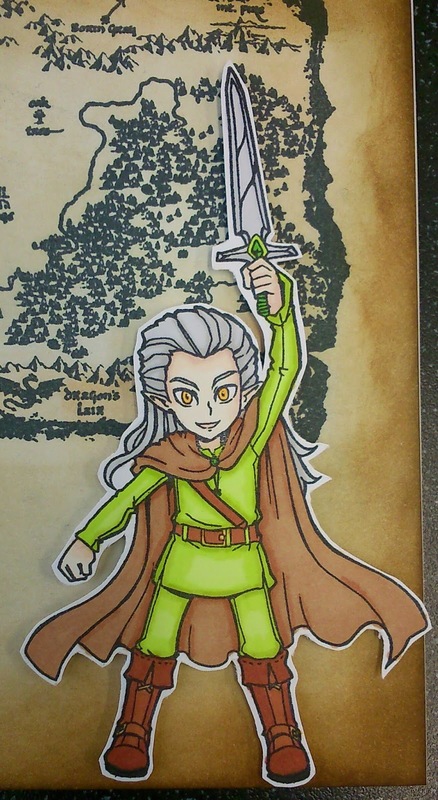 I coloured him in using my Promarkers, then cut him out ready to go on my card. 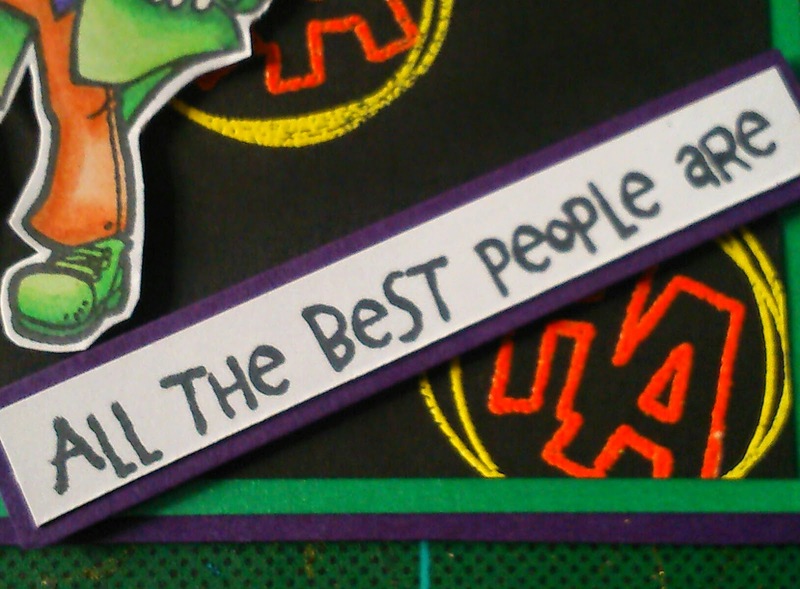 Next I took three pieces of 6x6 cards, one black, one green and one purple, cutting each piece slightly smaller than the last. 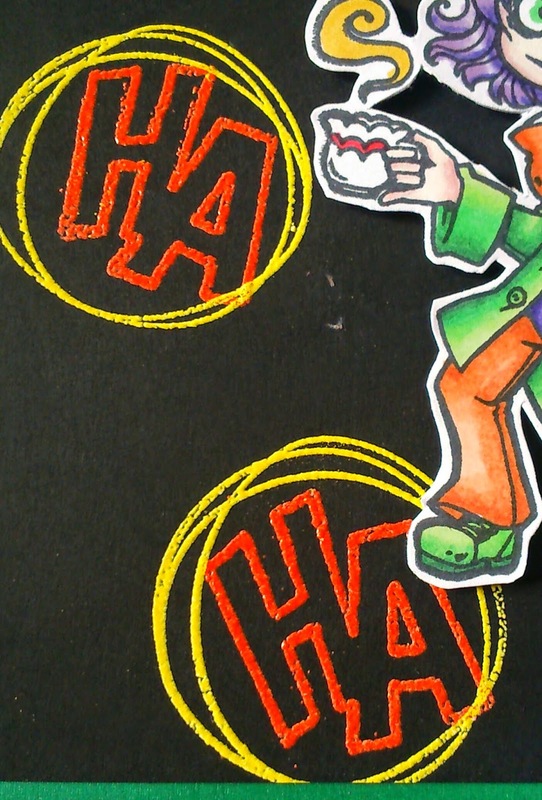 Taking the black piece of card I started by stamping the Ha several times in Versamark and embossed them in orange using WOW powder, then I stamped the scribble circles using Versamark and ebossed those using orange WOW powder. You'll notice that there a few little marks on the black card, I hadn't noticed there were a couple of pieces of powder on it and this is the result of brushing off embossing powder when it is not completely set (I had to be careful with the yellow circles so I didn't burn the orange words) I did manage to fix the problem with a little black Promarker. Phew! 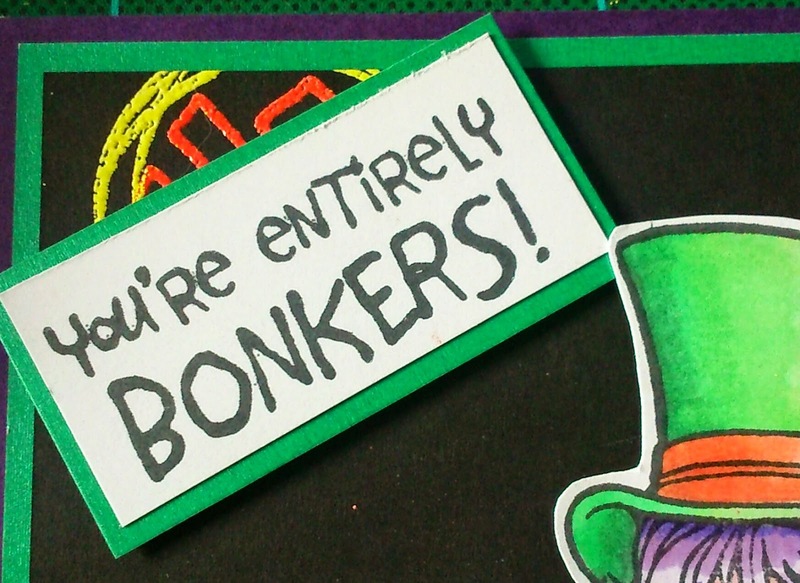 Finally I stamped the words that also come with the Hatter onto separate pieces of white card and mounted these onto a piece of green and a piece of purple. 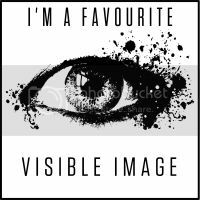 I have to confess I've had this Visible Image stamp for a while now but I haven't used it, so after a challenge from a friend at work to create something with my unused stamps I have made this. 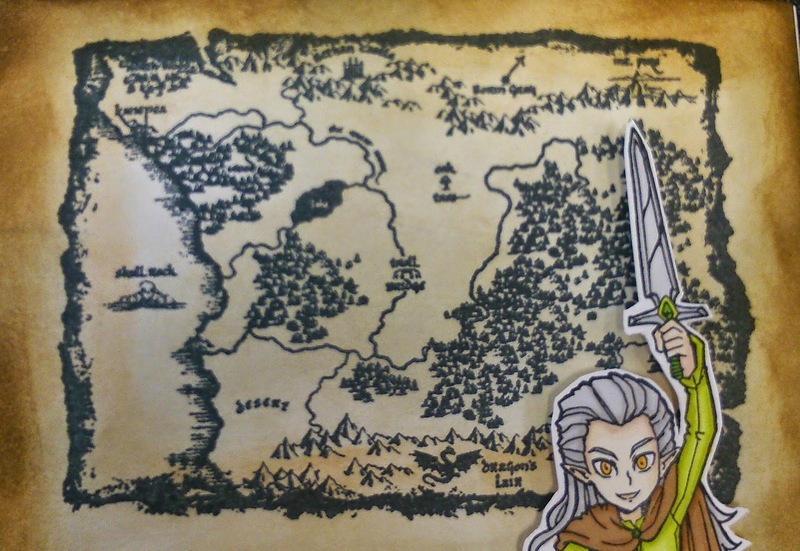 I started by colouring Orin in using Promarkers, then cutting him out. I chose greens and browns as I don't usually work in these colours but thought they were more elf like. Next I stamped the Mystical Map, also Visible Image, onto a white 6x6 card blank, I then put this to one side to allow the ink to dry. 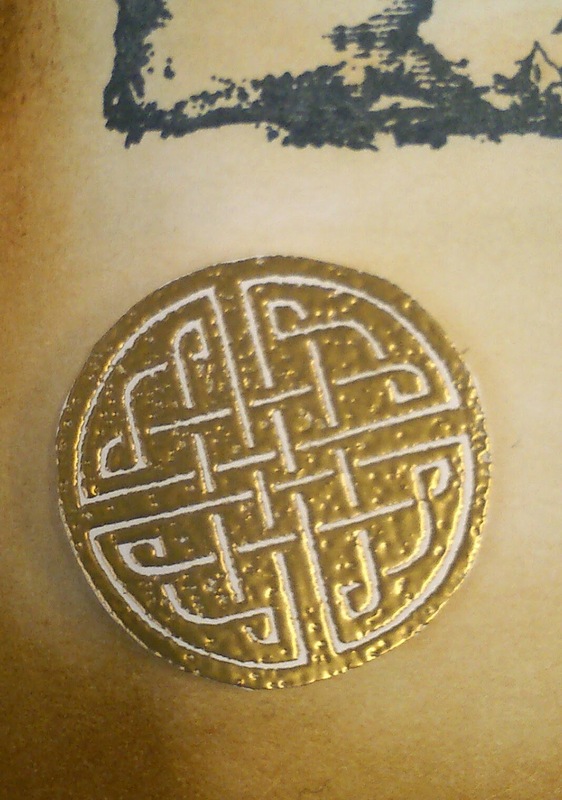 I used my time to stamp the celtic seal from the Orin set onto white card, embossed it in gold and cut around it. I then went back to the stamped card blank and began inking it using Distress inks, in various shades of brown, I wanted to give the card an aged look rather than the crisp white of the original blank. I know I've said this before but I love Visible Image stamps so here is another one for you. 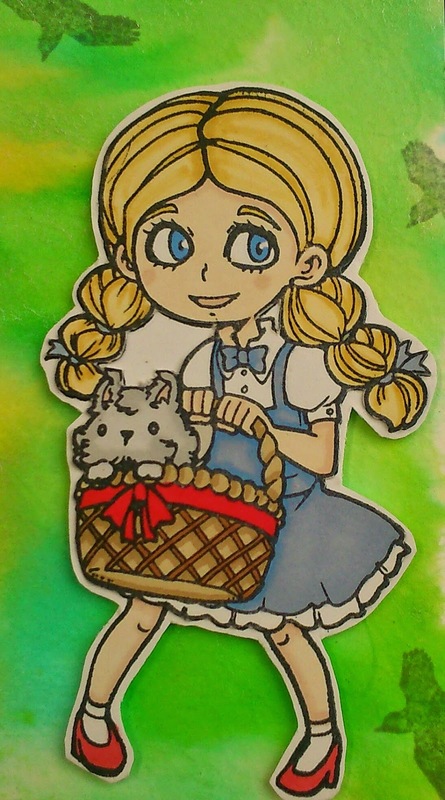 This is Dorothy from the Wizard of Oz range, she's been coloured using Promarkers and cut out ready to go onto a 6x6 card. Next I concentrated on the background, I've been playing about with my mica sprays to create different effects on my cards. 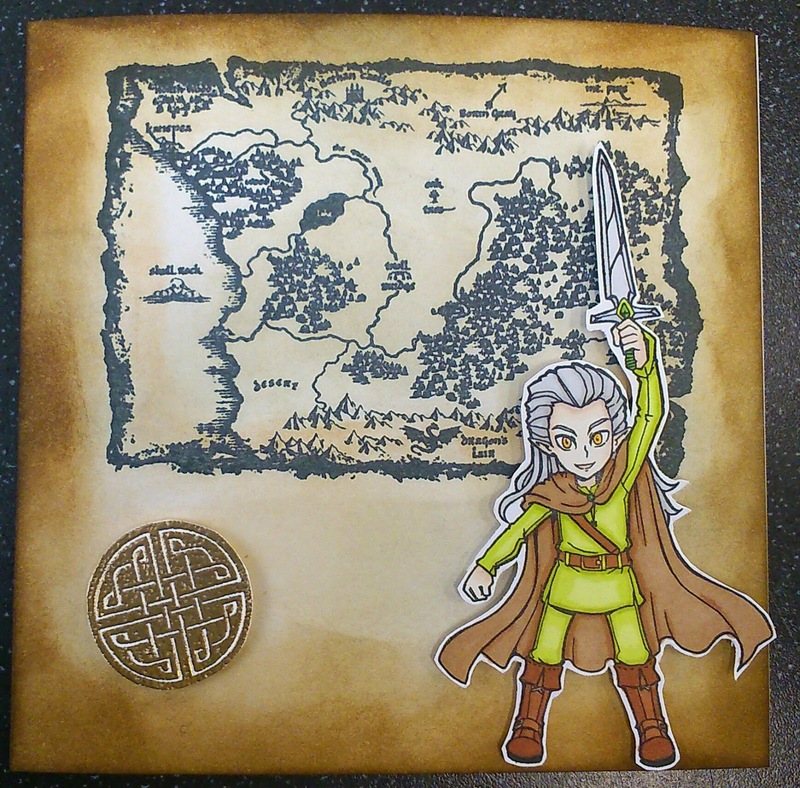 This one was done using watercolour card, water, green and yellow mica sprays. 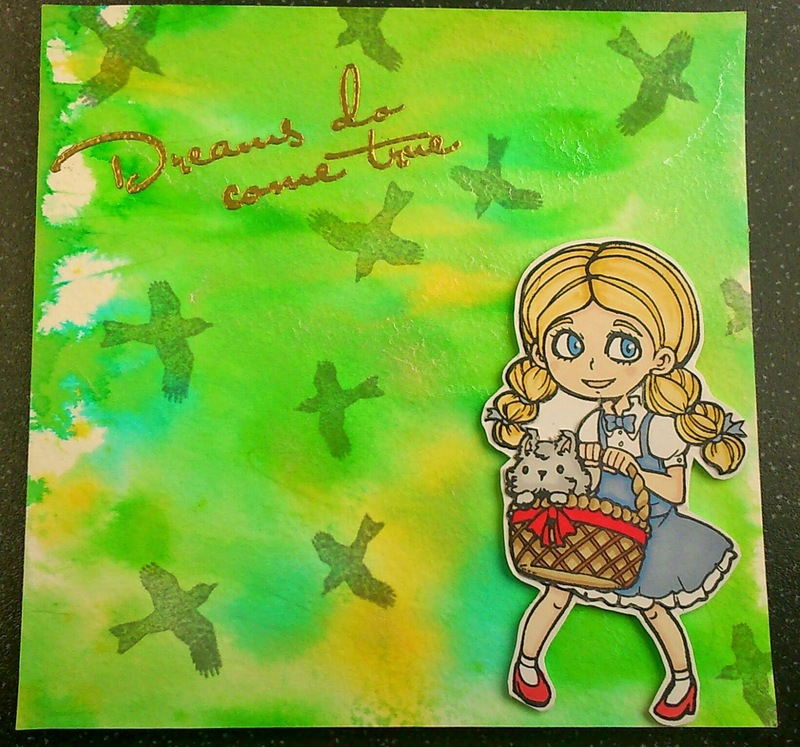 I was really happy with the 'yellow brick road' effect running throught the middle of my finished piece. 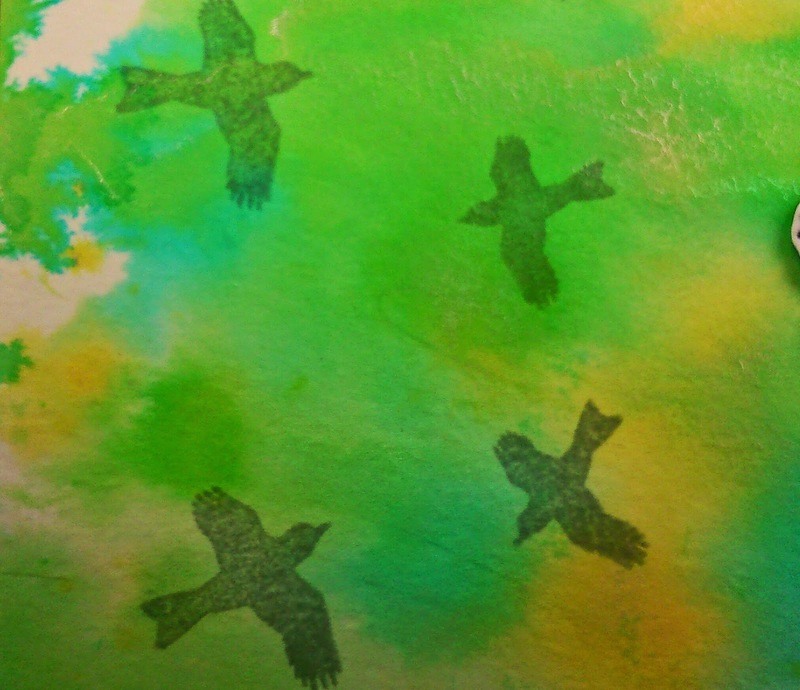 However this card was missing something, so I added the birds using the stamps included in this set, I used Memento to do this as I didn't want the stark black would have got from something like StazOn. 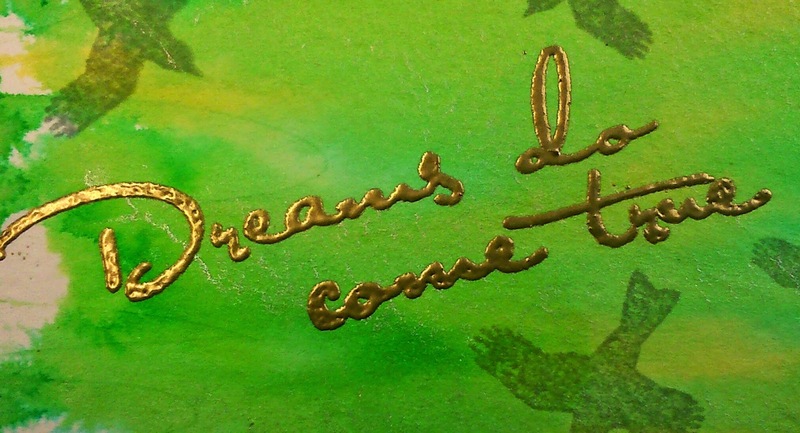 Finally I used another of the stamps from this set to create the embossed 'Dreams do come true' wording.